In a large saucepan add the olive oil over medium-high heat. Add the onions and sauté until soft and translucent, about 4 minutes. Add the garlic and sauté for an additional minute. Add tomatoes, cumin, oregano, salt and pepper, reduce heat and simmer for 10 minutes. Taste and adjust seasonings, remove from heat and place in a heat proof bowl. Return same pan to stovetop, wipe clean and heat over medium–high heat. Cook bacon until crisp, about 4 minutes. Remove from pan and strain on paper-lined towel. Add mushroom to saucepan and quickly sauté until tender, about 4 minutes. Remove from pan and place with bacon. Gently unroll refrigerated pizza crust onto lightly greased baking sheet. 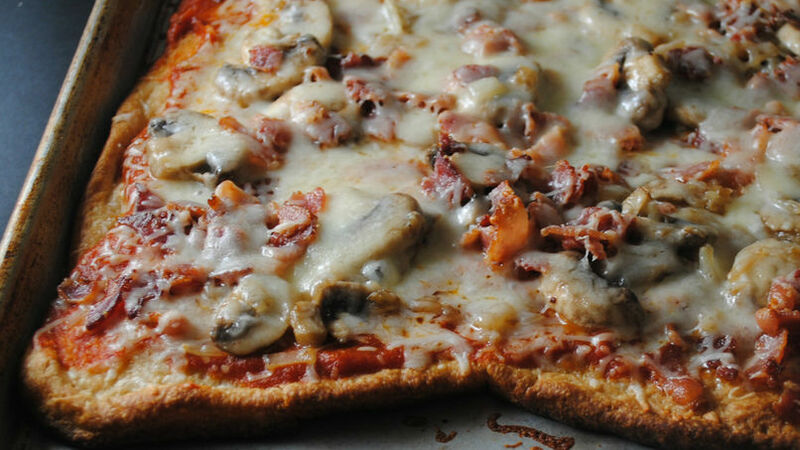 Spread pizza crust with pizza sauce, top with bacon and mushrooms and cheese. Bake for 15 minutes or until crust is lightly browned and cheese has melted. Swap Out: Make this pizza a meatless meal by replacing the bacon with bell pepper, squash or eggplant. Surprise the family with pizza night at home. This homemade pizza sauce is the base for a crispy, cheesy pizza that will hit the spot after a long day. Make the pizza sauce a few days ahead, place in fridge and your all set for a pizza night at home.